Usa Shrine in Oita Prefecture, is a sacred Hachiman shrine that was designated a national treasure and boasts traditional architecture. Tokyo and Oita, both of which are attractive tourists destinations, appear to be worlds apart on different islands. However, it is only an about 90-minute flight from Tokyo's Haneda Airport to Oita Airport. Experiencing quintessential Tokyo and Oita in three nights and four days is very easy, and one suggested itinerary is outlined below. The first stop of day one is Kappabashi-dori in Tokyo. Located downtown between Asakusa and Ueno, the nostalgic atmosphere of old Japan can still be found in unexpected places. Kappabashi-dori has over 170 specialty shops selling cookware, lacquerware, kitchen equipment and tools. This is a must-see area for those who are interested in Japanese tableware or kitchen tools such as knives. Plastic food samples are another popular item among international visitors. Visitors experience making sushi at Hassan in Tokyo. For authentic Japanese cuisine, visitors can take the Tokyo Metro Ginza and Hibiya lines from Tawaramachi Station to Roppongi for a chance to make sushi and of course, enjoy eating it. Stylish shabu-shabu (thinly sliced meat cooked by dipping it in boiling water) and sushi restaurant Hassan offers unique experiences such as learning about the history of sushi, a live demonstration of fish being prepared, guiding customers in making their own rolled and nigiri (hand-pressed) sushi, and an exquisite beef hot pot to accompany their sushi lunch. In addition to this, customers receive a sushi experience certificate. An about 90-minute-flight from Haneda Airport to Oita Airport begins the second day of the tour. Upon arriving, tourists can visit one of the major tourists destinations in this charming prefecture. There are about four round-trip bus services per day between Oita Airport and Usa Shrine that take approximately 60 minutes, and cost ¥1,550 one way. 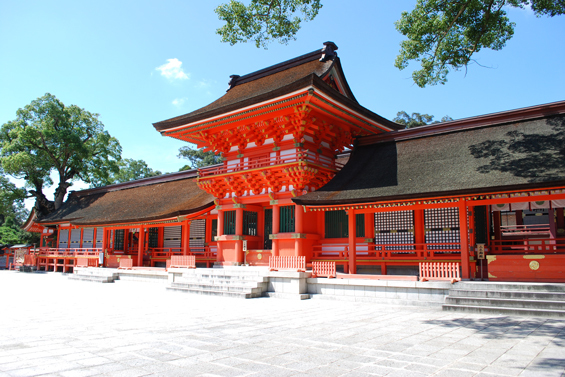 Usa Shrine in the city of Usa is the main sanctum for more than 40,000 Hachiman shrines in Japan, and its main hall, the prototype of the hachiman-zukuri style of traditional shrine architecture, is a designated national treasure. Usa Shrine occupies a large compound that includes an upper shrine complex, a lower shrine complex, a treasure hall and more. On day three, people can head to the city of Usuki, roughly two hours away by train, to see the historical magaibutsu, statues of various Buddha carved directly into cliff faces of soft volcanic rock produced by Mount Aso. The Buddha are said to have been carved during the 12th to 14th centuries and they have been designated as national treasures. The Buddha are divided into four groups, and each of the expressive figures are masterpieces of outstanding craftsmanship. The large sculpture of Dainichi Nyorai, one of 13 statues in the fourth group, known as Furuzono, is generally considered the most beautiful stone Buddhist statue in Japan. To get to the statues, visitors can take a bus from Usuki Station to the Usuki Sekibutsu bus stop. It takes about 20 minutes and costs ¥310. A taxi costs about ¥2,000 from Usuki Station or ¥1,500 from Kami-Usuki Station. On day four, Beppu awaits around 40 minutes away by train. Known for its onsen (hot springs), one of the most popular attractions is the the Jigoku Meguri (hell tour); a tour of the ferociously hot onsen known as the seven hells that are famous for spewing steam and boiling water. Each hell is named after the onsen's characteristics, size or the color of the water. For example, the Umi Jigoku (sea hell), Chinoike Jigoku (blood pond hell), Tatsumaki Jigoku (tornado hell) and Shiraike Jigoku (white pond hell). From Beppu Station, visitors can take the Kamenoi Bus bound for Kannawa to the Umi-Jigokumae bus stop. The bus ride takes approximately 20 minutes. Before returning to Tokyo, there are few spots people should visit at Oita Airport. Tabito, the souvenir shop located next to the departure lobby, is an ideal spot for last-minute shopping. Tourists can also watch airplanes up close from the observation deck as they come and go.